Happy Monday, folks! Now that I’ve been over here a good solid while, it’s kinda been time for a wardrobe update. I’ve worn a lot of the same pieces over and over again (which is exactly what I’d planned on), but now I’m getting a bit bored. Instead of wasting my time shopping in stores across London every couple weeks, I just hit up a few tried and true UK favorites online. The first is ASOS – because the warehouse is in London, with their premier delivery service you can always get next day delivery for only £10 a year! ASOS has always been a hit or miss for me, but when I do find stuff, it rocks. I usually can always find 2-3 things I want to keep out of 5-7 things I’ve ordered. Yes, this requires a bit of back and forth with the post office, but I’m so used to walking everywhere it doesn’t even bother me! 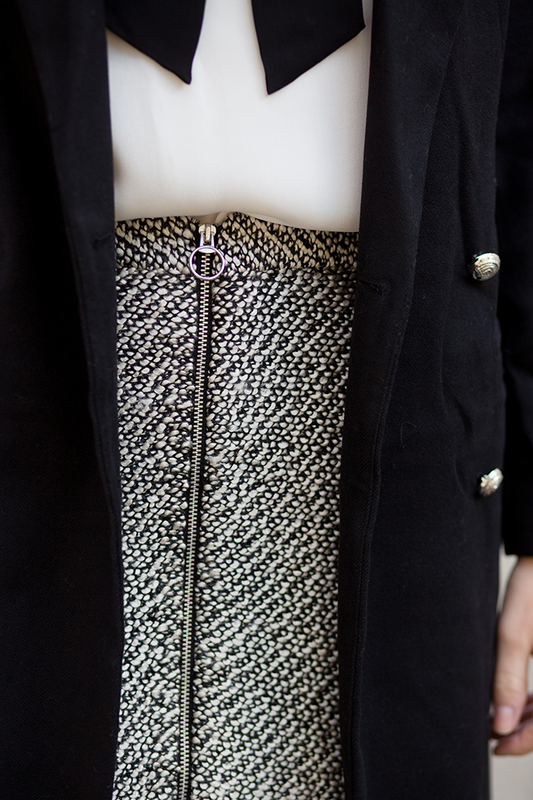 Two new items I picked up recently from ASOS include this elegant boucle skirt and this tailored blazer coat. I think both will be very useful when the temps drop further – the skirt will look amazing with tights and boots, and the coat I can throw over just about anything! Both were inexpensive, which makes the purchase easy and worth it. A few other pieces I’m craving on ASOS right now include this chain-detailed tweed jacket, this chunky sleeveless turtleneck tunic, and this incredibly chic camel coat. Stay tuned to find out my other go-to’s for online shopping while abroad! PS – apologies for the slightly wrinkled coat here… I’m having issues with my iron and buying a steamer here is so expensive! Hoping it’ll eventually just relax! This skirt is stunning, love this classy look. Obsessed with this look – that skirt is absolutely gorgeous…great find!! Love your bow blouse! So jealous the leaves are changing in London! Ooh! You just gave me some major inspo! I have a similar blouse (it’s sleeveless) and a black tweed skirt. Such a great pairing! Of course, I wish I had that white Chanel!! This is so beautiful. I love that skirt! I’m loving tops with bows and ties lately, this one is no exception. Great look!!! So classic and chic. The bow reminds me of my inner Blair Waldorf — obsessed! Cute! Love that zip front skirt! This is such a great outfit! Your skirt and top are so cute! I love Asos as they have great pieces to update your wardrobe without spending a fortune. Thanks for the next-day delivery tip! I’m new to London (and ASOS), so I’ll have to give this a go! The outfit looks very sophisticated yet fun. Great layering of some fabulous pieces! I really like this ensemble, especially the top. It’s so London. And yes, it will work just as well with tights. Do you mind saying what size skirt you’re wearing? I’m always nervous to buy online! Does it run big, small or true to size? Thanks! Love this look, that blouse and skirt are gorgeous! I totally agree that Asos can be hit or miss but their hits are SO GOOD! Great skirt! Love this tailored and chic look! Your skirt and top details make this really special. love this look! like in the title, it’s tailored so well. great look!